Online Exhibition Of Photography By Madhu Gopal Rao is an event that took place between 23-May-2007 and 01-Jun-2007 in Hyderabad. Missing Araku Valley? Well, if you aren't, you should be - it's been a lousy summer. And helping you miss it even better all this fortnight is Madhu. Alankritha Art Gallery is holding an online exhibition of black & white photographs by Madhu Gopal Rao, from 23rd May to 3rd June. 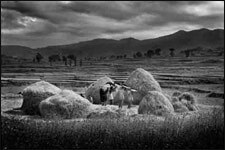 Titled Araku Valley, the online display contains 25 photographs clicked in the beautiful valley of Araku, which is located 120 kilometres off Visakhapatnam. Araku is a picturesque valley filled with the green and pleasant forests and the musical sounds of waterfalls. Rolling grasslands, lush orchards and pleasant climate make Araku a delightful place. The valley is inhabited by about 19 tribes - the women are beautiful and innocent, with their bright colored saris draped unusually. It is these splendors of nature that Madhu has captured in his camera. Madhu Gopal Rao has a Bachelor of Fine Arts in Photography from the JNTU College of Fine Arts, Hyderabad. He also holds an Associateship of the Royal Photography Society, London. His works have been selected and exhibited in Canada, Italy and China. Please contact 2311-3709/98850-80296 for further details. Be the first to comment on Online Exhibition Of Photography By Madhu Gopal Rao! Just use the simple form below. fullhyd.com has 700,000+ monthly visits. Tell Hyderabad what you feel about Online Exhibition Of Photography By Madhu Gopal Rao!